Hilo, Hawaii – A firm believer in helping our local community thrive, Ohana Fuels has donated $5,608.85 to Aloha Independent Living Hawaii through its “Fuel up. Do good.” Community giving program. Contributions provided by Ohana Fuels will be used to support AILH and their mission in helping persons with disabilities achieve greater independence through IL Skills and Training and making informed choices. “We greatly appreciate the generosity of Ohana Fuels and Hawaii Petroleum for their contributions and support” said Sam Nagasawa. In a testament of corporate and non-profit sectors partnering together Ohana Fuels is able to help the most vulnerable individuals and families in our community. 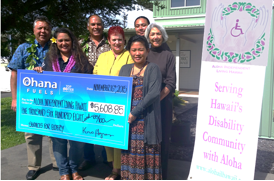 AILH is a 501 c 3 non-profit agency serving persons with disabilities throughout the State of Hawaii. This contribution will directly support AILH’s programs and services. This year from January to October 2015, AILH has assisted 710 consumers with disabilities living in Hawaii County to live independently in their communities by achieving their individual life goals.